Once again, I participated in the Valiant Warriors Quilting event sponsored by Joshua's Hands. It's a fabulous event - all the materials and the sewing machines are supplied. You just needed to show up willing to help - no matter what your skill level or talents, there was something for everyone to do. 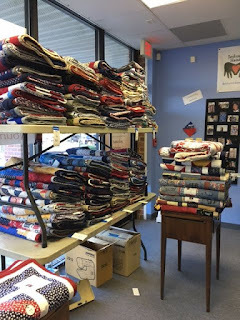 As you can see, there was an awesome variety of pre-cut fabrics to use for strip quilts. There were plenty of sewing machines in the front room, as well as in some of the interior rooms. There were several machines on the other side of the room as well. Many of the more experienced quilters either brought their own machines or would take the quilts home to work on them there. 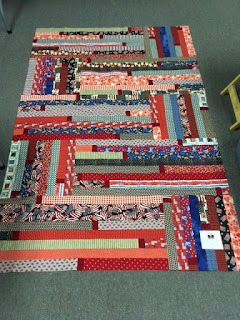 This time, I worked on the modified strip quilt. 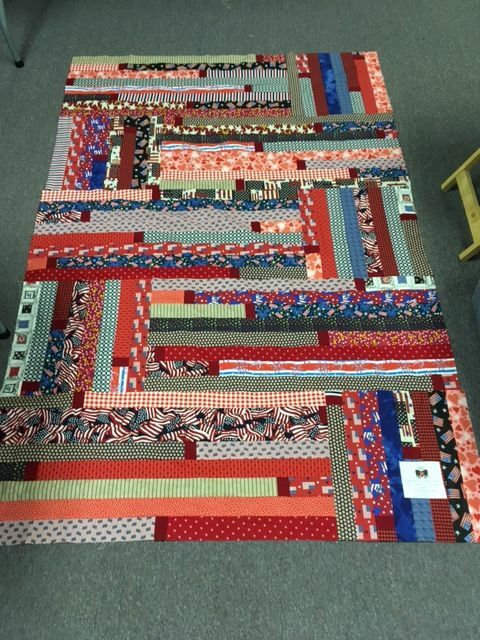 Instead of a straight strip quilt, it has sections that are horizontal as well as vertical. The first one I did a couple of years ago only had the horizontal stripes. The way this pattern alternates directions makes a simple quilt top really look elegant.. I love how this new pattern is laid out. It was a lot of fun. I learned so much from the experienced quilters - they are soooo incredibly patient! 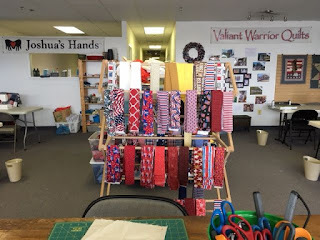 I had only ever hand-pieced a quilt before working on my first machine sewn quilt top the first time I participated in the Valiant Warriors Quilting event a couple of years ago. The experienced quilters were giving me tips on how to sew it together the best way to minimize the time it takes as well as to produce the least waste of the material and thread. I eventually plan to learn some of the other processes - including prepping it with the batting and backing, stitching it together, and ultimately, learning how to use the long-arm machine to quilt it! 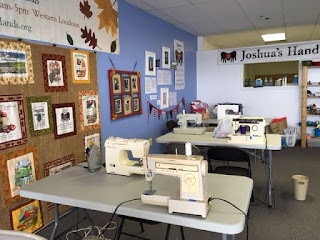 There should be plenty of opportunities to do this as the Station Stitchers (another Joshua's Hands charitable activity) are quilting year round. PLUS....in January 2018, there will be another Valiant Warriors Quilting event. So many opportunities!